Image Viewer is a software we all use in our everyday life. Different people use different image viewer depending on their needs and the OS they use. Most people stick with the default image viewer offered by their OS. And, to be honest, many of those image viewers are not so good. For example, most of the time, the default Photos app in Windows 10 takes some time to open an image. This might not matter to all but it surely does to many. So, those people start looking for a viable alternative. 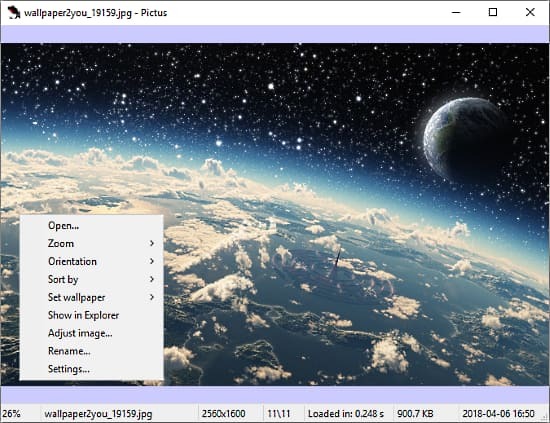 This article talks about 10 open source image viewer software that have the potential to be your default image viewer. Each of these image viewers offers a good set of tools and functions. Most of them also include adjustment tools to tweak images. And, some are even viable to be your default photo manager. 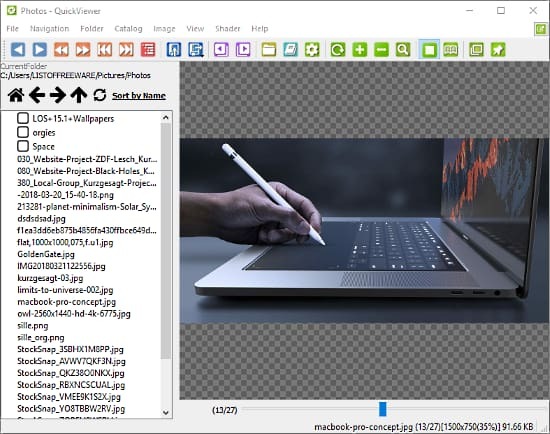 If you are also looking for open source image editor, do check out our other article 10 Free Open Source Image Editors for Windows. So, let’s explore these image viewers one by one. nomacs is an open-source image viewer that has the potential to be your default image manager. With its cross-platform availability, you can use it on all major desktop OS including OpenBSD and OS2. It is not just a photo viewer that supports a vast range of image formats, it is also an image editor. You can perform pretty much every basic photo-adjustment task such as color adjustment, tint, exposure, flip, rotate, sharpen, crop, resize and more. Apart from that, you can view metadata, histogram, file info and can add notes to an image. It also has an option to generate mosaic images and support batch operations. On top of that, it has a plug-in manager where you can add plugins to gain more features. And, you can open multiple instances of nomacs at the same time which is another useful feature most people want/need sometimes. You can download nomacs open source image viewer here. ImageGlass is an open source image viewer software. It is versatile and small in size. It supports all major image formats including HDR, RAW and PSD image. ImageGlass has all basic features and tool that an ideal image viewer should have. Its magnify and scale adjustment tools enhance the user experience. ImageGlass can be used as a photo manager software. You can add your entire photo-collection to it and easily view, delete, rotate any image with its simple to use tools. It also has an edit option which you can associate with an external software for photo editing. You can also change the visual appearance of ImageGlass by installing themes, changing the background color and other toolbar and thumbnail options. 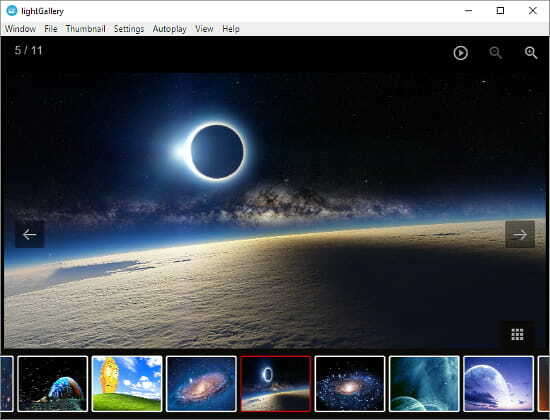 Download ImageGlass open source image viewer here. 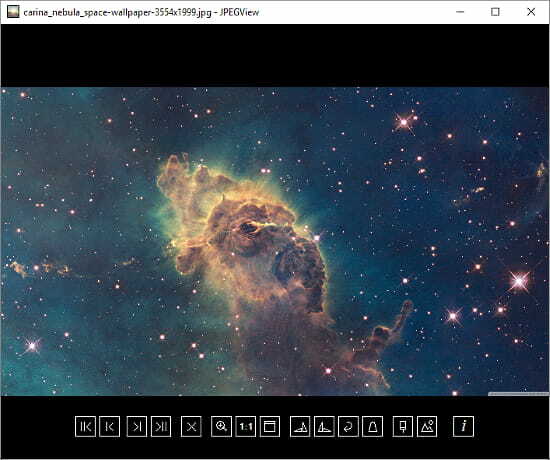 JPEGView is an open source simple image viewer. It has a clean user interface with an auto-hide toolbar. In terms of functionality, it covers all the basic aspects of an image viewer. It offers basic image adjustment tools including auto correct, color-balance and lossless image transformation. Apart from that, you can view histogram and metadata of images and perform batch operations like batch rename, copy, etc. You can also tweak the GUI to improve the user experience. 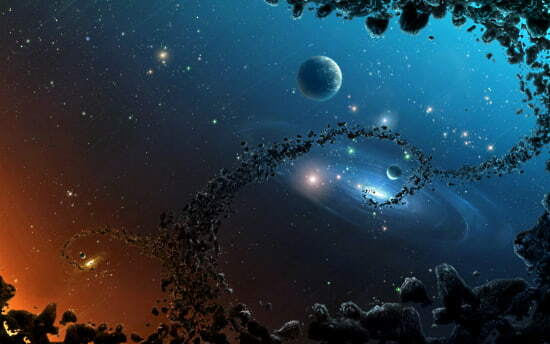 You can change the navigation style, sort images by various aspects and set hotkeys for various options and tools. All these features make JPEGView a decent image viewer. Here to download this open source image viewer. 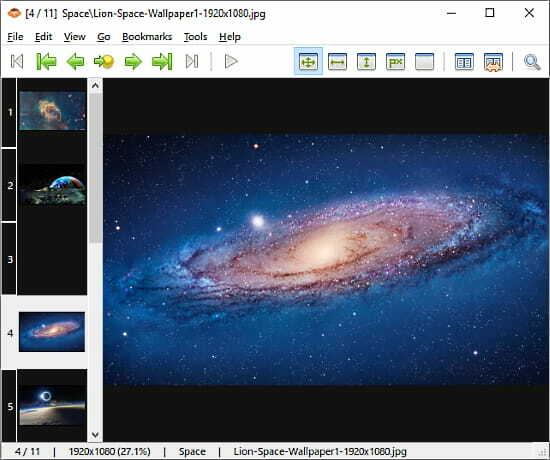 QuickViewer is another open source image viewer. Rather than offering more image adjustment tools like others, its main focus is to improve the user experience. To do that, it offers many features that you might not know you needed. For example, you can set the default orientation for the wider images, 2-page spread and so on. Apart from that, you can rotate the image, change its brightness, contrast, and gamma value. You can create catalogs of images and tweak it accordingly. It also has a shader feature which adds different shades to your images. You can use this feature to tweak the shades and shadows in your images. 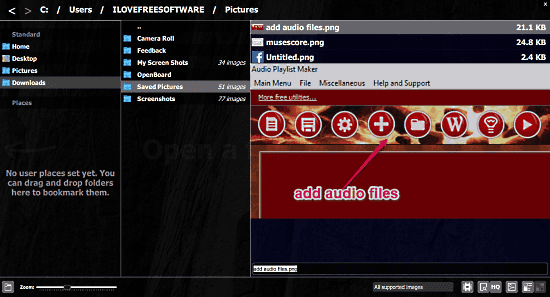 Download this open source image viewer here. 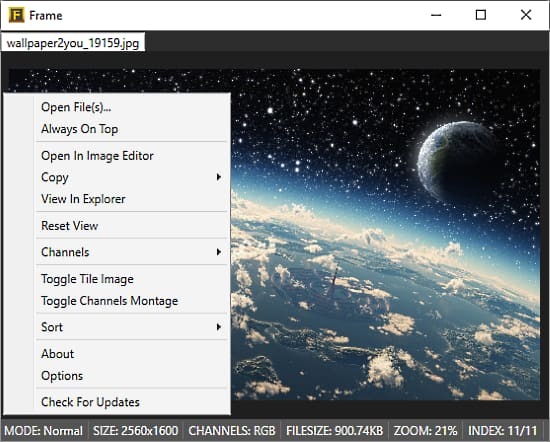 vJPEG is a borderless image viewer that offers an immersive photo experience to its users. Despite the name, it can open all major image format including PSD. The whole idea behind this image viewer is to open larger images files rapidly. After opening an image, you can drag it around the screen and resize it simply by pushing to the left or the top edge. With 138KB executable file, its size is very tiny for an image viewer. Regardless of tiny size, it also has hidden keyboard commands. With its different keyboard commands, you can resize, rotate, and auto-levels images and email the actual or compressed version of images. You can find this open source image viewer here. 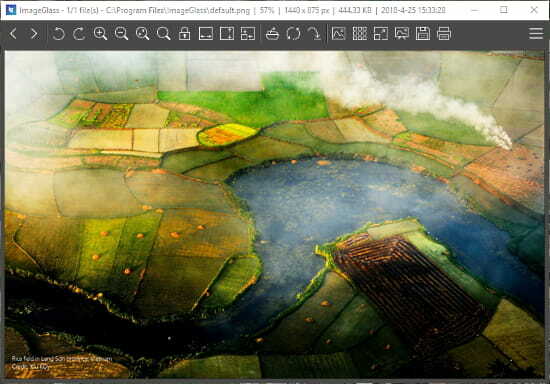 PhotoQt is a powerful open source image viewer written in C++/Qt. The UI is divided into 3 sections; one shows standard folders, second includes the sub folders and the third lists all the images within a particular folder. PhotoQt always runs in full screen mode, you can not resize the window size. It supports many formats and uses GraphicsMagick and Libraw image processing system. LightGallery is another simple image viewer software. It does not offer any type photo adjustment tools which is okay, its a photo viewer after all. It enriches your image viewing experience with many different features and options. For example, you can change slideshow timing, speed and transition mode, loop the slideshow, enable and adjust auto play options and so on. The user interface is modern with good animations. The cross-platform availability makes it a good options if you need same photo viewer on all of your systems. Another open source image viewer in this list is Frame. With Frame, you can easily browse through your photo library and perform a set of specific tasks. When you open an image in Frame, it shows its basic info at the bottom of the screen. With its channel function, you can adjust the color channels in your image. Here, you can sort your images in any order you like and toggle tile image (makes a 3×3 tiling image) and channel montage. You can set an external photo editing software so that, whenever you have to edit, you can easily switch to that. You can download this open source image viewer here. 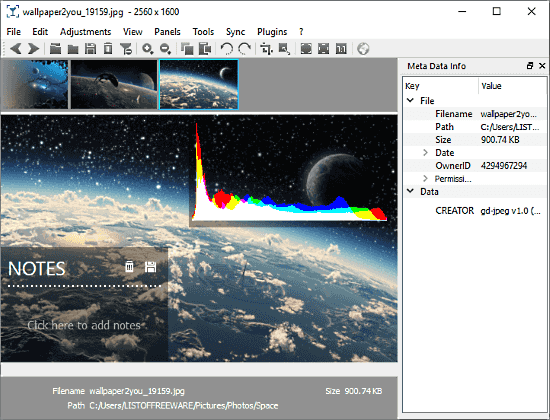 Pictus is a small image viewer software. Just like Focus, it shows the basic info about an image at the bottom bar along with loading time. Apart from being a tool to view images, it is very responsive and offers some useful features. With Pictus, you can easily change the orientation of an image and adjust its brightness, contrast and gamma values. You can also rename the image and set it as wallpaper right from the Pictus. It supports all major image file formats including PSD and PSP. It also helps Windows Explorer to show thumbnails for these formats. MComix is another open source image viewer in this list which is specifically designed to handle comic books. It supports a variety of container formats including CBR, CBT, CBZ, CB7, LHA, and PDF. It has Double Page and Manga mode to make the magazines and comics reading experience a bliss. Here, you can transform images and enhance them by adjusting their brightness, contrast, saturation, and sharpness values. You can add bookmarks to images and can also edit those later. In the Manga mode, you can switch between right-to-left and left-to-right, as per your comic. With these features, it serves as both, an image viewer and a comic book reader. All these open source image viewers are viable to be your next default photo viewer. They include all necessary tools and features along with their own custom functionalities. If you think your image editor can be better, do check these out and share your opinion with us in the comments.